The two qt-sized containers fit into my insulated lunch bag, the blender bottle held my breakfast drink. My breakfast juice consisted of oranges & apples. This juice tasted delicious during my first glass in the morning. Around 9AM I was feeling pretty hungry and had a headache to boot. Drinking more of the orange juice was starting to upset my stomach- I think it was too much orange/acidic juice at once. I’m forcing myself to drink a lot of water- I’ve had about 24 oz. so far today. 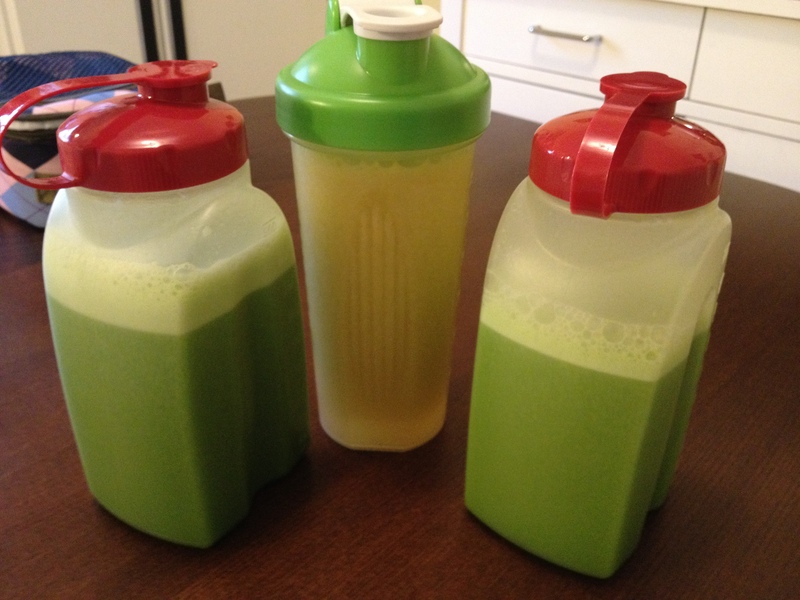 By the end of the school day, I drank the orange juice and one container of green juice. I got through rehearsal with just water, and then drank about half of my 2nd bottle of green juice while driving to Whole Foods to pick up more organic veggies. The 4:30-6:00 window was the toughest. I was hungry, cranky with Tim because he got to eat real food, and had a massive headache. I’m not taking any headache medication (I read that I should try not to), so I’m trying to tough it out. I did not feel a trip to the gym was a good idea- being spacey and kind of light headed. But I did use my 15lb Kettle Bell at home to do a few arm exercises. This helped kill some time & got my mind off of being hungry. For “Dinner” I drank pure carrot juice. It was really, really good- and carrot juice comes out a bit thicker so it felt more substantial. I went to bed at 8:30 rather than sit awake thinking about food. I woke up feeling fine and not very hungry. I made three different juices (it took forever to clean the juicer each time). Breakfast: Clementine juice. Simple- a bit sweeter than all the orange I drank yesterday (which made me queasy). The only problem is it took about 9 clementines to make 10 ounces to drink pre-work. Morning snack: Pear & Cantaloupe. Pear juice is delicious, and I had some chopped cantaloupe from Whole Foods I wanted to try out. The combination was great- very light tasting & easy to drink. I drank about 20 ounces of this between 10 – 11 AM. Still forcing myself to drink lots and lots of water… which means lots of trips to the bathroom! Lol. Headache is gone & I’m feeling pretty great! This combination was pretty good- the peppers gave it an interesting & new flavor. I drank this for lunch, followed by a lot more water. Around 7 PM I set about making my ‘dinner’ juice, and I was craving savory tastes & thought I would experiment with garlic (which I read in some recipes). I used half of a small clove… still too much. The juice tasted ok at first but the garlic flavor was SO strong- I couldn’t finish it. I hated wasting the juice (lots of carrots & spinach went into the concoction), but I just couldn’t drink it. By the time I made a new juice of carrots, spinach, kale & a tomato- I was not even that hungry anymore. I’d say I drank about 5 ounces, then lost my appetite for juice and just drank water until bedtime. 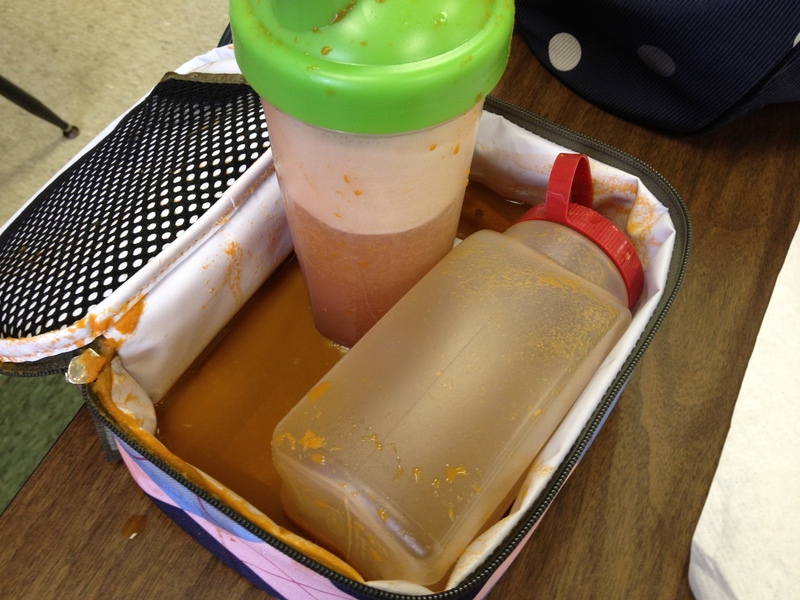 I must not have screwed the cap of my carrot juice container (the square-ish one) tightly enough- and by the time I got to work and went into my tote bag for my water bottle, carrot juice (my lunch…) was flooding the bottom of my bag. Fortunately, though my computer case got a bit wet, my laptop was ok- and all important paperwork survived. The corner of my Into the Woods score has a bit of an orange tint to it… oops. Rather than attempting to run home at lunchtime and juice/clean/get back to work on time, I decided to try out a healthy cafe that offers fresh juices in town. Tasted great- and I didn’t have to clean up! Bonus! 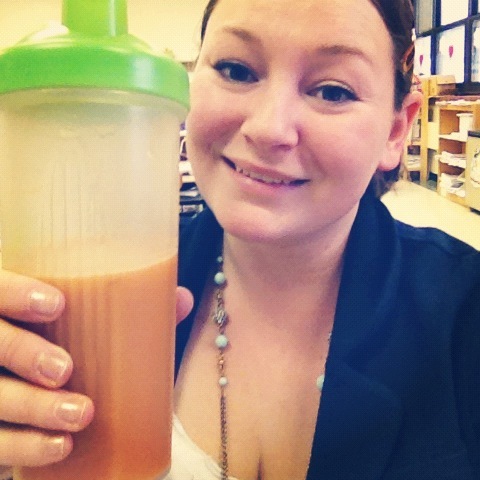 I drank carrot juice for dinner, and went to sleep satisfied that I completed my goal of a 3-day cleanse! On Thursday morning, I was down 4 pounds since Monday. That brings my total “post ring” weight loss to 10 pounds- which is right in line with my 4 lbs per month goal! 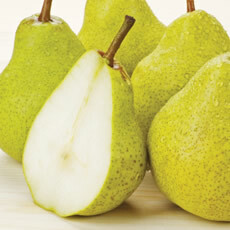 Did you know that Pears are a source of a variety of nutrients, including fiber, vitamin C, antioxidants and potassium? More to come in a couple days! To prep for my juice cleanse, which I plan to begin on Monday, I hit the grocery store today & spent 35 minutes exploring the produce section. (I will not tell a lie, typically my shopping trips involve a quick walk through the produce, grabbing some bananas, tomatoes, and the occasional yellow pepper before I move on to the aisles of pasta, bread, cheese, and… frozen pizza). Bearing that confession in mind, I had a lot of fun reading and comparing the labels on the fruits and veggies, and stocking my cart with an abundance of fresh, colorful foods. I bought pounds of apples and oranges, carrots, cucumbers, kale (which I had never heard of until recently) and other delicious fruit and veggie options. This weekend will be for experimentation. I’m trying to ease myself into this new diet plan, by replacing a meal (sometimes two) a day over the past week with a fresh juice. This morning I had delicious orange & apple juice, and after returning home from the store I set about my first real attempt at a super green, super healthy veggie-packed juice. I made this concoction up (after browsing a few juice recipes), and I decided to name it The Sour Cucumber. The prep took about 5 minutes, after peeling the lemon & cucumber and slicing up the apples. The mouth of my juicer is almost big enough for those apples, but it was easier to quarter them so they don’t get stuck. The result was quite tasty! At first I thought I might have used too much lemon, but after drinking a bit more I really liked the sour taste. I’m not sure what kale tastes like on its own, but I didn’t mind it in the drink. I would also like to point out that while I was prepping my juice ingredients, I threw a handful of french fries in the oven & grilled a sandwich for my future hubby. I was honestly not even tempted to cook the same for myself, although now- about an hour post juice-meal, I am definitely feeling hungry. I’m going to make a fruit juice in a little while, and will be eating dinner tonight. 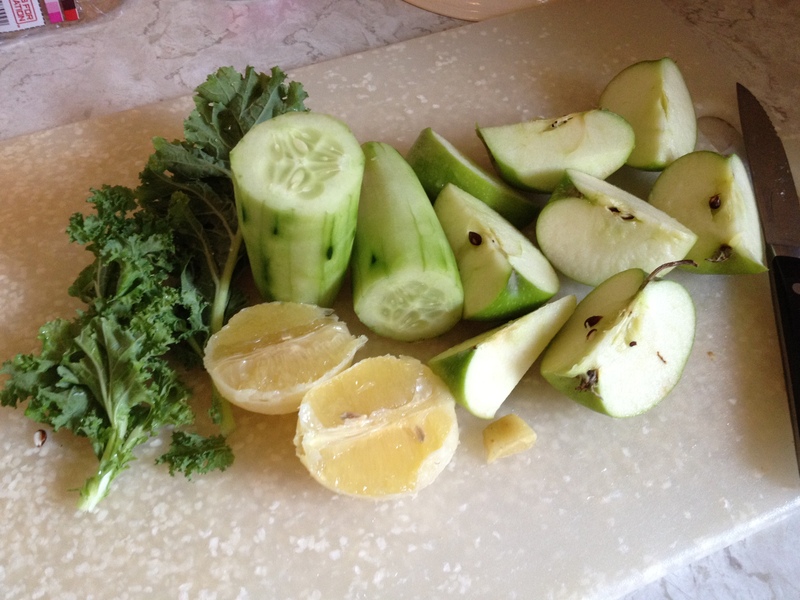 This is going to be pretty hard, but the mixing-juicing-experimenting part is really fun! The biggest downside is cooking and juicing simultaneously, cleaning up, and not having a dishwasher. Prepping for my Juice Cleanse & drinking my veggies for lunch today! T minus 8 months and 3 days to Bridal Body. 10 oz. of vitamin-packed goodness! I am officially prepping for my first-ever attempt at a Juice Fast. The goal is to begin this adventure this coming weekend (or perhaps Monday, depending on certain weekend activities). I’ve been doing a lot of reading about juice fasts, if they work, why they work, and how they work. I will be completely honest with you- I am doing this for the sole purpose of hoping to lose some weight. I’m pretty cool with the added benefit of detoxifying my body of poisons and yadda yadda… but let’s be real here. I’m getting married in 8 months (WOW), and going shopping for a wedding dress this past weekend was a total weight-loss motivator. I’m not expecting to miraculously drop a dress size in a 3-5 day cleanse, but I am optimistic that committing to something that involves nutrient-packed, organic fruits and vegetables will help put me on a path to weight loss and health. I get the juice cleanse is probably a bit of a fad-diet right now, and these NYC doctors have some reservations about the overall benefits and usefulness of such a program. At the same time, watch a little of Fat, Sick and Nearly Dead and you’ll be convinced juicing can save the world. My philosophy is- try it. I’m not going to kid myself (or you, Internet) and act like I’m ready to carry out a 10 day juice fast like these guys recommend. I think we all know my love affair with food is a bit too powerful to allow such craziness. 3 days, however, I think I can handle. Who knows, maybe I’ll feel great and push it to 5. I doubt it. So, first item of business in the ‘prep for the fast’- get a juicer! I did my research (thank you Amazon customer reviews) and settled on the Breville BJE200XL 700-Watt Compact Juice Fountain for $103.94 with free 2-day shipping thanks to my trial of Amazon Prime. 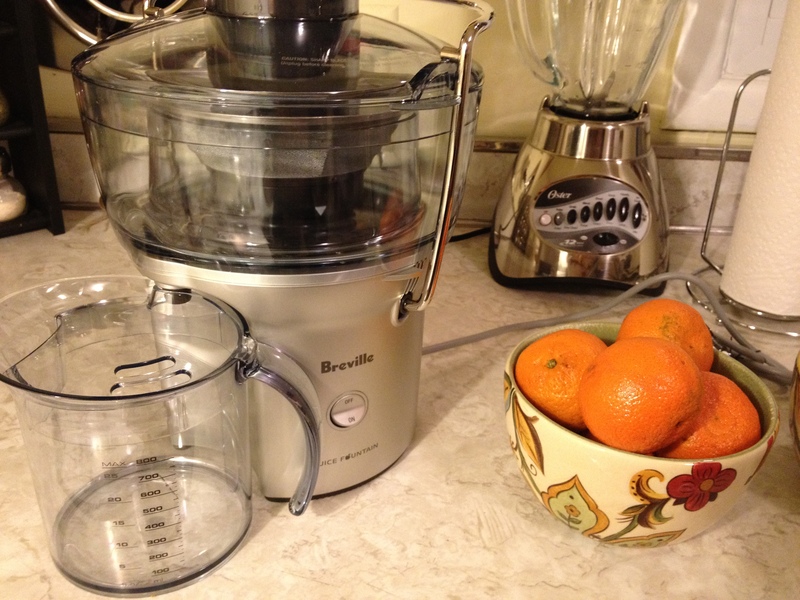 While not the best on the market, this juicer seemed to fit well in my price range and had excellent customer reviews. It arrived on Tuesday and as soon as I got home from work I opened the box and assembled the thing. It was super easy to put together, and the design is pretty neat. The pieces snap together nicely, and after washing the parts and assembling I was ready to juice. The only problem was, the only fruit I had left in the entire house was a bowl of 5 clementines. Clementine juice it would have to be! Clementines are my favorite healthy snack. Internet (and possible readers? ), let me tell you: clementine juice may be the most delicious thing I have ever tasted. Some reviewers of this juicer liked that the juice collector had a top to sepearate out the foam. Personally, I'm a big foam-fan, so I drank it. Yum. It tasted like an Orange Julius from the mall. 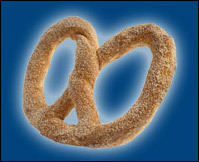 The only thing missing was a cinnamon-sugar Auntie Anne’s pretzel. 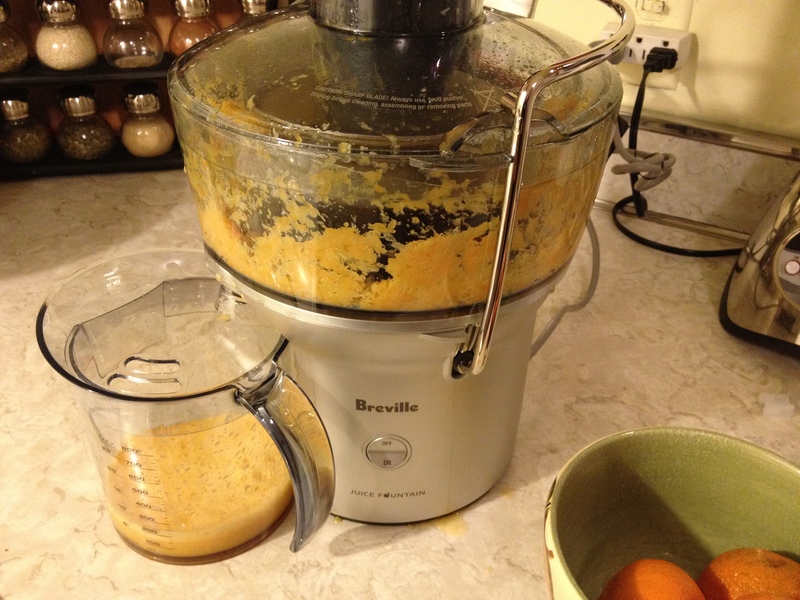 The Breville is pretty easy to clean, although I think a juicer with a pulp collecting basket or bin would be easier, as this juicer collects the pulp in the center piece, which then needs to be scraped out. Breville provides you with a handy scraping tool & brush that really speeds up the cleaning process, though. It took me about 2 minutes to clean, and took up my entire dish rack, but overall I am happy with the juicer. It packs a lot of power! This morning I juiced 1 apple, 1 pear & 1 orange, and this thing made the apple (skin, core, seeds & all) disappear in a hot second. It was pretty fun. I am trying to follow some ‘prep for a juice cleanse’ rules, like cutting out caffeine and processed foods. The caffeine is a struggle, and I’ve had a persistent headache for the past two days. 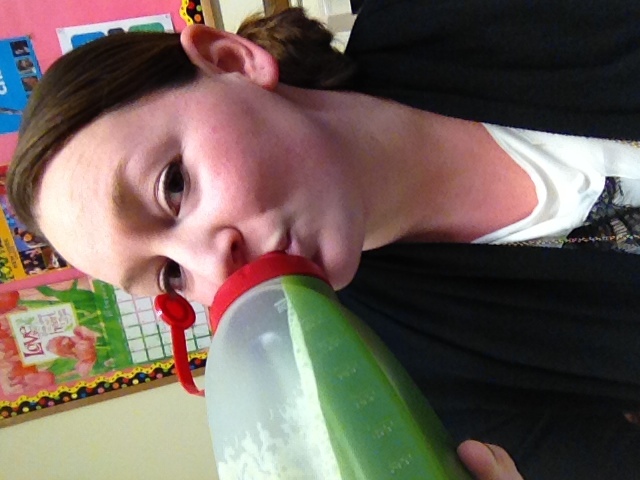 Today I drank juice for breakfast and the green monster spinach smoothie for lunch. I felt pretty good throughout most of the day, but know I am not drinking enough water. Stay tuned for further updates on when the official juice fast will begin, and how it goes. 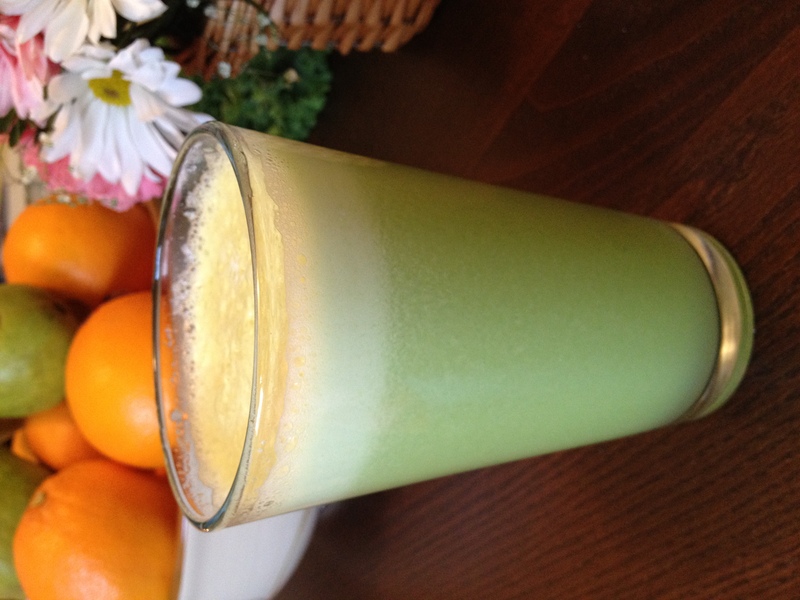 If you are one of my few readers- have you ever tried a juice fast? What do you think about the whole idea?